How to become Certified Nutanix Platform Professional (NPP 4.5)? Hyper-Converged is fancy word along with Hybrid-Cloud solutions. Nutanix brought my attention last year and I cleared my Nutanix Platform Professional 4.5 certification exam in December 2016. I’m planning to attempt next exam – Nutanix Support Specialist (NSS) in couple of months to enhance my Nutanix skills. I want to share my experience with others as I spent some time to research the path to write my NPP 4.5 exam. Nutanix offer three types of Certifications along with Sales track. The Nutanix Platform Professional (NPP) certification confirms your ability to install, configure, and manage the Nutanix environment. 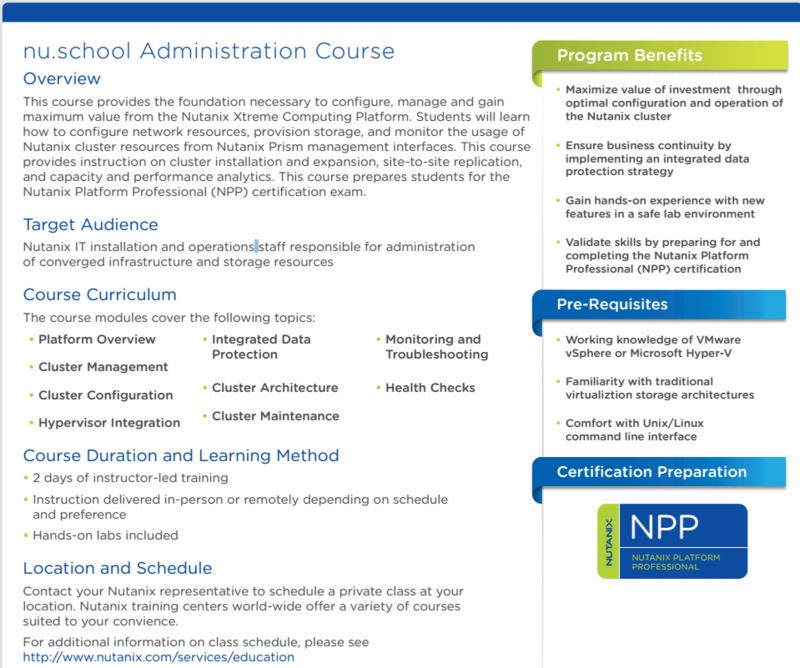 The Nutanix Administration course is recommended prior to taking the certification. How to Prepare: The Administration course is offered in multiple formats including self-paced Online-Plus, instructor-led virtual or in-person. The instructor led course is a full 2-day course offered by one of our authorized trainers around the world. But I love below option if you are Nutanix customer, Partner or Service provider. I registered my company e-mail ID and sent an e-mail to education@nutanix.com to enroll for the course. One of the agent respond with e-mail notification with Course details and grant access to nu.School portal. You will be allowed for three attempts to clear the exam with 50 questions. Each module is optional along with questions at the end of module, which means you can directly attempt the exam but I recommend you to finish all modules to attempt the exam. Score will be given for each module and finally attempt the exam for Certification. Let’s assume you are not qualified for Nutanix Customer or Service provider channel and it’s required to attend their nu.school Administration course either online or class room training. You can find more details about it here. Thats nice Satish, love the way you explained and thanks again for sharing your experiance with us. I will plan NPP in coming month.